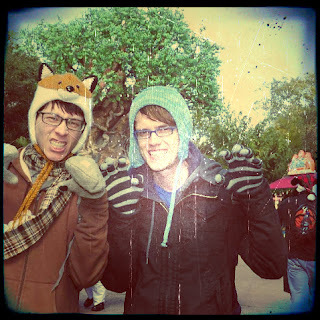 Disney Hipster Blog: Your Morning At Animal Kingdom...At Home! Your Morning At Animal Kingdom...At Home! Yay! I was so happy to get all the positive feedback surrounding the very fun/silly Epcot playlist I made. I based that playlist on actual Disney Hipster "rope drop" strategy. So, if we go on Soarin first, that is the music you hear first. Got it? Because I have nothing better to do on this lovely Easter evening (Adam is cleaning the huge mess we made in the kitchen....cooking for 12! Yikes!) I decided to make another similar playlist, this time taking you to Animal Kingdom. -Walk, don't run, through Discovery Island. How wonderful, thank you for sharing this! I also enjoy the Pizzafari music (though I've never eaten there). I'll keep my fingers crossed for a Magic Kingom and MGM playlist in the future! Thanks for such a wonderful blog, I always enjoying reading/listening/watching what you post. Love it! Where do you get your music from? I have the stuff you can buy on CD, but it's those extra bits of park audio that are hard to get hold of. Oh, and right with you on the touring - we always head straight to Expedition Everest.